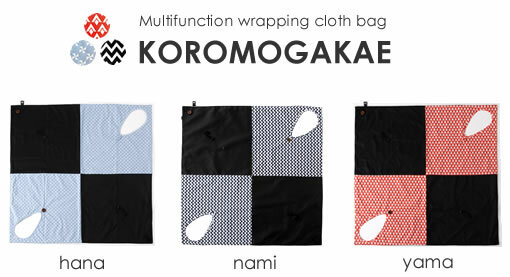 KOROMOGAKAE is a multifunction bag that can easily wrap items of various sizes. 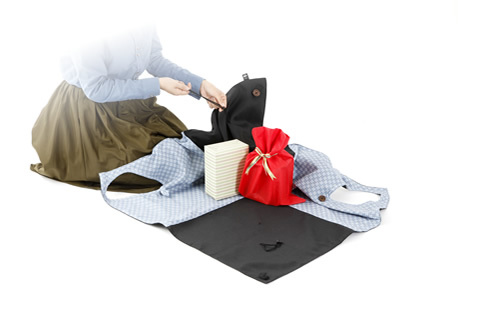 Since you can spread it out like a Furoshiki (wrapping cloth) and place items on it, items that you normally cannot carry with a bag can be easily wrapped. Using it is also very simple. Use it normally as a shoulder bag when shopping. 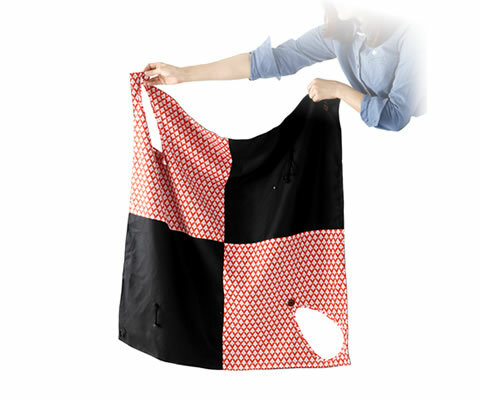 Very useful as auxiliary bag that will securely attach to your carry-on suitcase when traveling. If you are going out with your baby, carry the toys and spread it out and to put things away, just close it up. Its very convenient when going out. Compact when folded making it convenient to carry. When spread out, it can turn into a large capacity 17 liter bag. 3 different styles of lining with cute Japanese patterns. How you use it is up to you.